This acrylic on Stonehenge painting entitled Space Invasion is an example of the self-reflexive work that has intrigued me for years. In the liminal space between nature and culture the digital office with my PC and scanner was clearly at the centre of my life. Art history books lie open as the digital and print worlds come together. There is an art book I have kept since the 1960s by the director of the Confederation Centre Art Gallery on Prince Edward Island artist Robert Harris [I was born and grew up just blocks away from the Centre] beside issues of the Inuit Art Foundations magazine Inuit Art Quarterly. These institutions were both pivotal in my life experience in teaching and art production. There is also a full series of CDs produced by the National Gallery of Canada in the 1990s in a very progressive digital step-forward. This initiative largely influenced my own MA presented on a CD on Inuit artist Jessie Oonark (RCA c.1906-1989). The painting was produced in the middle of a heavy snowstorm on Lac Gauvreau in the Gatineau Hills in an A-Frame a year after the ice storm. We were stubborn refugees of that 1998 ice storm going to the local village high school in the evening along our with neighbours and soldiers in uniform to get warmed up rather than accepting offers from friends to await the return of electricity and heat in our home in the comfort of theirs. The old fireplace here did not provide enough heat and we finally had to give in and stay with friends. The tree coming into the cottage refers to this insistence of nature to overcome culture. I began the painting before the storm and the branches arched upwards. But I had to change that after the storm, a pentimenti. In order to have more accurate mise-en-abyme detail in the storm lantern I painted a separate painting of it as I did of the fireplace itself. The tablecloth in dining room nook is a waxed cotton print from Africa where we lived in the 1980s. 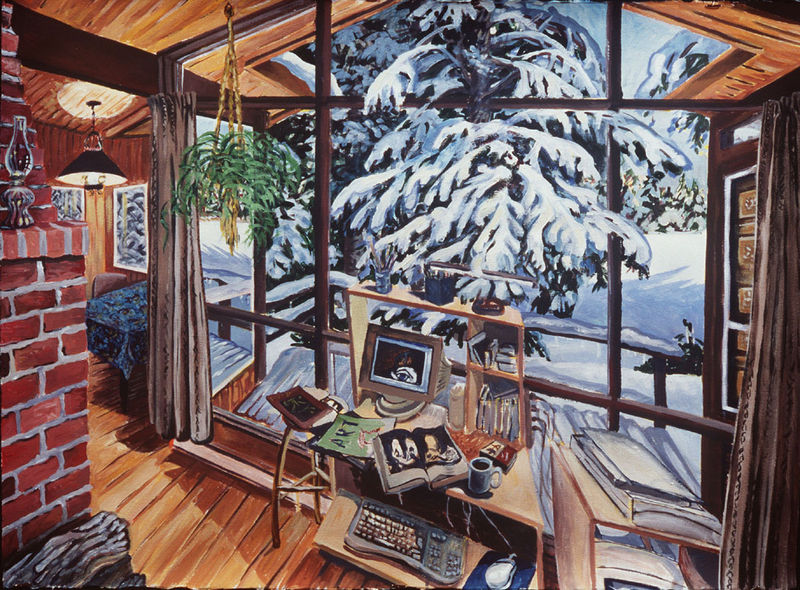 The painting of the same size which was sold in the 1999 exhibition was of the same lake but with a Bateke mask on the wall painted in warm colours in contrast with the cold blue snow.